It's usually the tourists who run afoul of bears, Laura. A few years ago I rode my motorbike to the west coast for lunch - Wikaninnish Inn. Coming back out to the parking lot I saw a large RV. The adults were by their vehicle but I saw their kids running around chasing something. It turned out to be a black bear cub. I hustled the kids back to their RV and told their parents to get them inside after explaining, in my best and not very good German, that where the cubs were their mother was never far behind. It was as though the idea never cross their minds. I've never had an issue with black bears. However there have been sighting of brown bears (Grizzlies) north of Courtenay. They sometimes swim over from the mainland. The brown bears are far more predatory. Have you run into any cougars yet? The island is full of them. It's said to have the highest density of cougars anywhere. We had one on the street a couple of months ago. The homeowners heard something outside in the middle of the night and checked their motion-activated security camera the next day. There was a cougar in their driveway but no harm done. The cardinal rule, as I'm sure you know, for cougar or bear is never turn your back and make a run for it. That's just ringing the dinner bell. Now I need you two to trust me on this one - summer is just around the corner. No, really. It is. It can't rain forever. WOW. You'd think families would read up on safety before venturing out in an RV. Scary! I haven't seen a cougar yet, but I hear about them all the time. One of my libraries is in Port Alice, and they've been having problems with cougars stalking people. Two animals have been killed. Before our time, the house we're renting had beautiful trees, but they were all cut down because of the presence of cougars. One killed a neighbour's dog, and the trees were the solution. Oh yeah, no running! I'm sure I'm not the first person to wonder if I could maintain composure if I came face-to-face with a bear. I've only seen them from a safe distance. I'm not sure spring is even here yet! So sweet looking! Especially from the safety of your car. We had the bejeezes scared out of us by rangers and others when we were in Yellowstone and Grant Teton back in 2012. We bought bear spray and returned it after reading the directions! They were pretty funny (not intentionally). E.g., it said to make sure you don't spray into the wind---like we could tell the bear to move over before we sprayed. It also was incredibly complicated to open the soray can---we'd have been dead before we did. So we just took our chances, made lots of noise, and stayed close to other hikers. We did see a few bears but always from the car also. What a natural wonderland you've found! In Denali, you take a long bus ride through the park - it's the only vehicle allowed on the road. 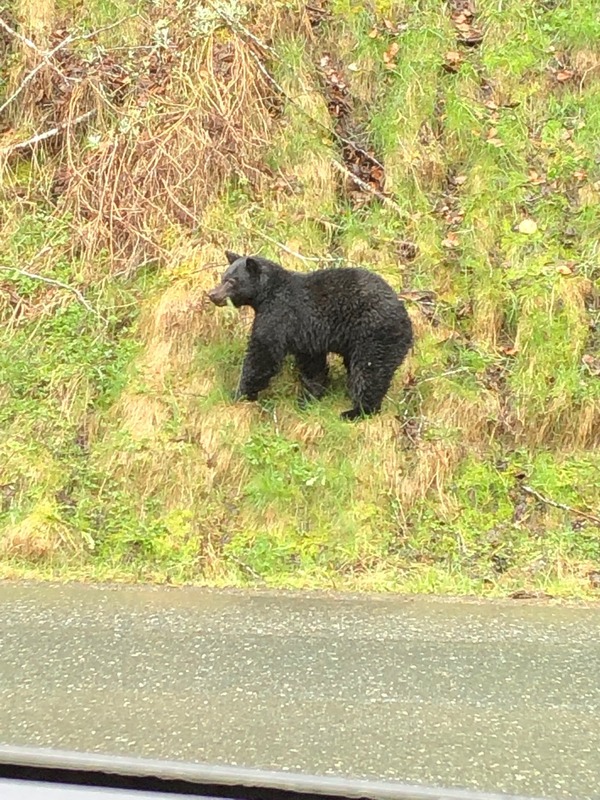 We saw many bears and cubs from a distance, but one time there was an adult bear right beside the road. The bus stopped (as it does for all wildlife sightings) and everyone went to one side of the bus to watch. The bear suddenly turned around and took one step towards the bus -- and everyone involuntarily gasped and jumped back. We were inside a bus, perfectly safe. But seeing the size and heft of the animal, and how quickly it moved, gave us all a fright. I think Denali Bear also stood up to his full height as he turned around and faced the bus. That probably prompted most of the gasps. He was tall. That's so close to get to a bear!!!! He looks fluffy, too. If he were a dog, I'd be feeling his fur to see how fluffy he is. But I suspect that, being a bear, he wouldn't consent. Mama bear, who was likely not far away, definitely would not consent! We were really close, though. I still get a buzz thinking about it. Even more so for the WOLF we saw in western Ontario.